A small cloud is traveling above the city while expanding it's size. 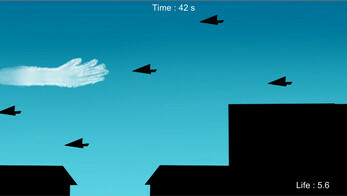 Help it to travel with collecting clouds, shooting the planes and dodge the planes and buildings. Beware, shooting can decrease your life. Survive the required amount of time to see the ending. This game was made for "Shacknews Game Jam." Extracts the game on your desired location.